Adrienne L.Where do you live? My daughter and I stayed in Apartment Rose. The villa is beautiful and lovingly kept. It was very clean. 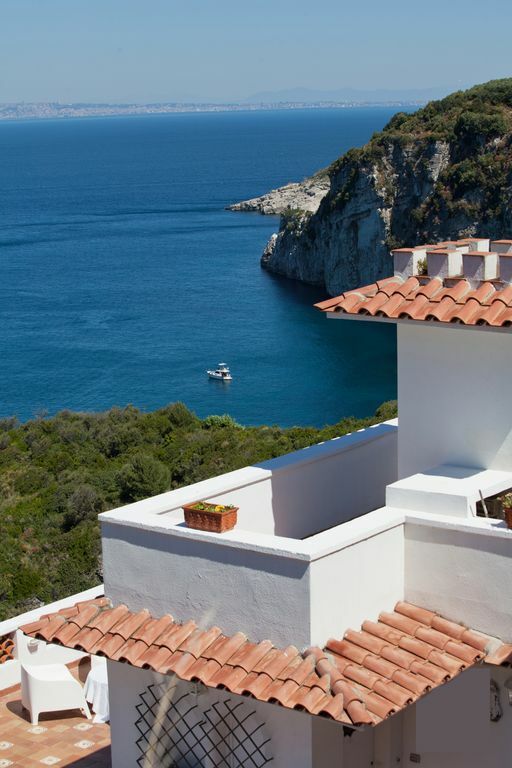 The best feature was the panoramic terrace which had a view of Capri in the distance. Definitely a great place to relax. Unfortunately the pool was not available during our stay. The property is built into the cliff side so needless to say there is quite a steep hill up to the main road. It's about a 15 minute drive to Sorrento. We booked three tours during our stay and only one company was willing to drive out to pick us up. There is a SITA bus stop conveniently located at the top of the road leading down to the villa so we were able to take public transportation to and from Sorrento from Villa Dafne. If you're planning on eating out, you'll definitely need to have a car as the bus stops running by 8pm or earlier and taxi's are very expensive in the area. Overall I would recommend this property if you are looking to be near Sorrento but are longing for peace and quiet as well. The town of Massa Lubrense is within walking distance . There you will find a few eateries and shops. The house is perfectly located, and has a stunning view to the ocean. The furnitures and equipment are ok, I think would need an update in some things like the chairs and tables, and kitchen appliances. We thought we were meeting the owner since the guest book is filled with nice words for her, but in 4 days she didnt come to present herself. The last day when we were already leaving, I had to ring on her door since we left a charger in the appartment and had no longer the keys, so we finally met her for about 1 minute. Great location & property. Paola & Francesco were very helpful & friendly. Highly recommend. Villa Dafne is in a great location & close to bus routes, trains & within walking distance to shops and restaurants. The location is close enough to Sorrento to provide opportunities to venture out on excursions and also to enjoy what the local area has to offer .The view of the Bay of Naples from the villa is spectacular. Local Sita buses also run along the Amalfi Coast.The owners Paola & Francesco could not have been more helpful and accommodating ensuring that our stay was memorable. They also helped to arrange pickup for us to and from Naples airport and the driver was pleasant and helpful and we used him later during our stay for a day of driving and sight seeing along the Amalfi. We were guests when we entered and friends when we left! Dear Frank & Paola thank you so much for your nice words! We try every day to accomodate our guests at the best and we are very proud when our hard work is appreciated. You are very special persons: host you has been a pleasure! It's true: you arrived as guests and left as friends! The villa was just as beautiful as described in the listing. The property was very clean and well maintained. Paola was so helpful in answering all of our questions and giving advice. The one upgrade we would suggest would be new bed pillows-a little soft for our taste. Sorrento is a great hub for sightseeing trips by train or boat. Capri is a must to visit and do ride the chair lift. For seniors a car or taxi is helpful for getting up and down the hills. Hope to see you again in Massa Lubrense at Villa Beatrice! My husband, two friends and I stayed in the 3 bedroom Grapevine apartment at Villa Dafne for two weeks in June. The apartment was exactly as the pictures portrayed. Paola and Francesco live in one of the apartments and they were very helpful. When we booked we did not realize the pool was not scheduled to be opened until June 15 (at the end of our trip). Francesco agreed to fill it the next day and by the third day of our stay it was ready for use. It is a small pool but felt great after a few hours of hiking. He also helped us when one of our party fell and cut her face while in Naples, he drove us to the farmacia to get medical supplies. We arrived from Rome much later than expected and they were very accommodating. The apartment is very spacious and the beds were comfortable. The bathrooms were in good working order. The kitchen appliances were all quite new. The terrace was a lovely place for dinner each night while watching the sun set over the Med. The location is great. It is a short walk down (everything is up/down) to the sea which is calm for swimming because of a large breakwater. There is a walking path into Massa Lubrense and there is great bus service that stops at the road to the property. Don't miss the great series of walking paths in the area - be prepared for lots of climbing but walking through the lemon groves with views of the sea is fantastic. We were very happy with the accomodatons and would rent it again when we go back for a third visit to the area. A couple of suggestions for making it even better would be to provide a few more cooking utensils, serving dishes and dinnerware and cutlery. Also, providing charcoal for the BBQ would make it easier for guests to use it as it is a hassle to try to find charcoal. Overall, this is rental is good value. Note - WIFI service was patchy. We will do our best to improve and to follow your suggestions. See you next year with pleasure! Beautiful villa with Amazing views! The whole villa is beautiful and has amazing views wherever you look. The Limoni apartment is great for 2 people and has everything you need. Paola is a wonderful host and is always willing and able to help in any way she can. So if you´re planning on going to the Sorrento coast, this would be ´the´ place to stay! Massa Lubrense is located in the middle of everything! And just a quick ferry ride to Capri! We would definitely go back to Villa Daphne! Thanks Paola! and thanks Francesco! Dear Monica, thank you so much! We do our best to make our clients in confort and relax! It was a pleasure meeting you and I hope to see you soon at Villa Dafne! Villa Dafne is a charming property located just a few miles from Sorrento, exactly just outside the small fishing village of Massalubrense in a position that offers breathtaking views of the colourful Bay of Naples Capri, Ischia and Procida. It is a complex of three indipendent apartments: you can rent a single one if you belong to a small family or to a small group of friends; you can rent, instead, the entyre villa if you are coming in a large party to celebrate unforgettable events. The swimming pool is for all the guests of the villa and is equipped with sun loungers and umbrella. The largest of the three apartments can welcome six to eight guests: it is composed of a large living room, two bathrooms, a very nice and typical kitchen and threee bedrooms together with a private terrace. The other two apartments are almost twin and can welcome four guest each. They are both composed of a double bedroom, a kitchen-living room, a bathroom and a private terrace.